So, our first bicycle ride on the Harlem River Valley Trail, starting in Millerton, NY, was a wonderful trip! We started off after a delightful lunch at Harney and Sons tea outlet – and my buying out most of the store! Must have my Keemun and Breakfast Supreme! The day was absolutely perfect for a bicycle ride: not too hot but sunny and clear. We saw a plethora of the most wonderful critters! I increased my count of birds seen this year with some unique additions. Unfortunately, they moved too fast for me to get any good pictures, so I’ll have to rely on other sources for illustration. When riding past the big pond in the cattle pasture along the trail, I saw this heron flash by over the water. He was too small for a Great Blue Heron –– and didn’t have a crest. But he wasn’t the right color for a Green Heron; he was a dark, slatey blue. 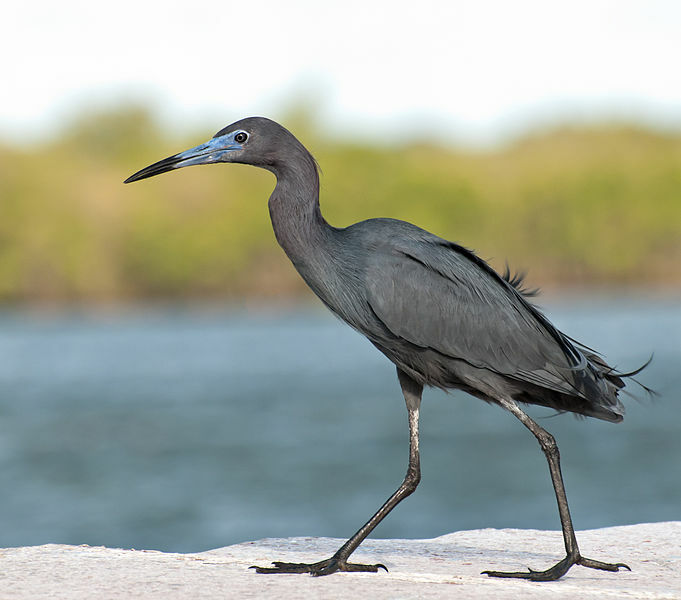 He reminded me of pictures I’ve seen of the Little Blue Heron, and when I checked several sites on line I discovered that’s exactly what I’d seen. Here’s a picture courtesy of Dario Sanches via Wikkipedia. Interestingly, these birds usually aren’t seen this far north. However, some have been sighted in New York and New Jersey. So, my conjecture as to his identity seems to be right on the money. 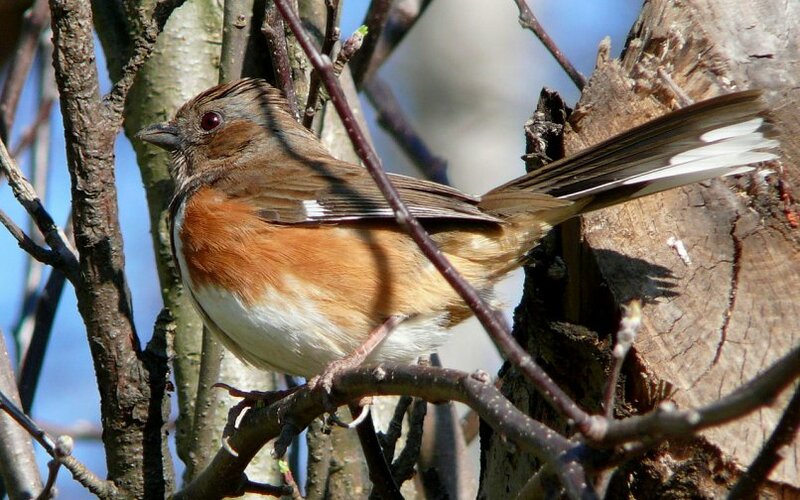 (1)Male By Bill Thompson of U.S. 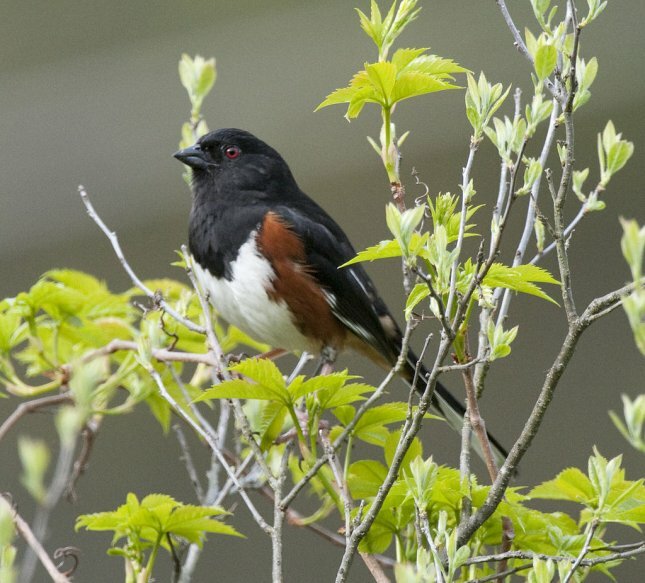 Fish and Wildlife Service Northeast Region – Photo of the Week – Male eastern towhee at the Quabbin Reservoir (MA)Uploaded by Snowmanradio, CC BY 2.0, https://commons.wikimedia.org/w/index.php?curid=15297291 (2) female (Photo from Wikkipedia, By Ken Thomas – KenThomas.us (personal website of photographer), Public Domain, https://commons.wikimedia.org/w/index.php?curid=3423294; 2. 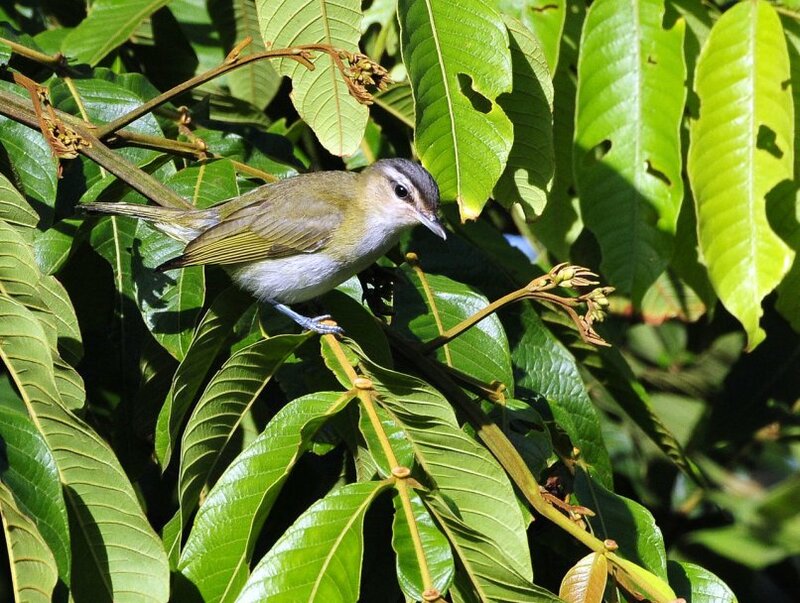 I may also have seen a Red-eyed Vireo. I’m not sure what color his eyes were; he was too far away, and he was wearing shades. We also saw tons of red-winged Blackbirds, Catbirds, Grackles, and Robins. We were treated to some lovely bird song from all these feathered critters. What four legged beasts did we come across? Lots of rabbits, a garter snake, and chipmunks. We even saw baby chipmunks that were really tiny. Only gray squirrels showed this day, though I have seen red ones here in the past. And the funniest thing was to see a groundhog galloping through the woods below us. Those suckers may be plump but they move fast. Better here than anywhere near my garden –– or my friend Amber’s, if they know what’s good for them! good…as always…to read about your adventures!